Fruit and Vegetable Parchments are fused to pure tarnish-proof copper and glazed with a nontoxic, lacquer-like protective finish. The copper shines through the brightly colored fruit and vegetables giving a warm, enamel-like glow. All jewelry is lead and cadmium free. The cuff is 1½ inches wide and 6½ inch long. They are water resistant and adjust to fit most wrists. 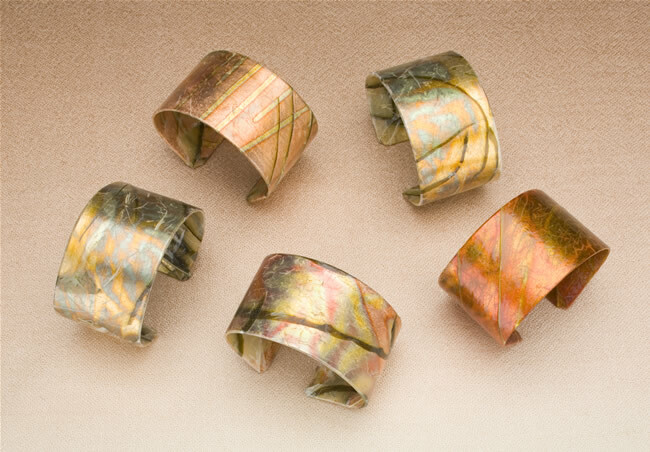 The Gilded Cuffs have an undercoat of variegated gold metal leaf that shimmers through Thai green papaya parchment.